Once upon a time, a college football player told his professor he would never take a job in sales. 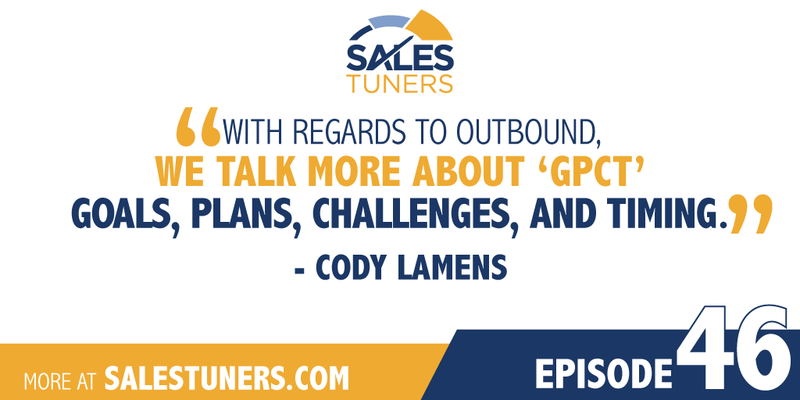 From squirt guns and whoopie cushions to camp management software and work for one of the first companies to get into the SaaS space, Cody Lamens (@CeLamens) has sold it all. But he’ll be the first to tell you it’s about more than the bottom line. To Cody, a self-described altruistic people pleaser, sales is about helping others. It’s about empowering the sales leaders of tomorrow with the knowledge and professionalism they need to offer vital tools to organizations that need them. That is the goal in all he does as the head of sales at TINYPulse, an employee engagement and performance management platform. Early in his career, Cody intentionally moved laterally across organizations, taking roles in finance, operations and sales. Why? He sought to learn and aimed to be as well-rounded as possible. Now he sees to it that every sales professional he comes into contact with does the same. To Cody, a solid sales process starts with specialization and focus. Inbound is different than outbound – each should be approached with a unique and focused strategy. From there, Cody’s steps to success include seeking opportunity, being a sponge and ultimately becoming both proficient and efficient at your craft. And it all starts by figuring out how you can help. Take Advantage of Opportunity: There is a short window of time to take advantage of every opportunity. If you wait until an opportunity presents itself, it’s already too late. Seek out chances to learn, be more efficient, and give 100 percent from the get-go so you’re never in a position to wonder what might have been. Doors open on a daily basis, but oftentimes they are short and they are small. It’s crucial to take advantage of them when they’re there. Preparation and Repetition Always Win: You know what you need to do. You’ve spent time role playing real scenarios. You’ve paid attention in training and during your one-on-one’s. With that, don’t think that your sales manager knows something you don’t. You’re the one facing live fire every time you get on a call. Make sure you’re taking the time to prepare and let the repetition of muscle memory take control. Don’t Wait Until The End: The earlier you ask hard questions, the better. For instance, if you wait until the negotiation stage to start discussing budget, you’ve already lost. You need to be able to tie your value to real business problems without it looking like you’re now just trying to close a deal. Figure out how to show your prospect they’re better off with you, than without you by going deep in the beginning.